Gauteng (/xaʊˈtɛŋ/ khow-TENG; Southern Sotho: Gauteng [xɑ́úˈtʼèŋ̀]; Zulu: iGauteng; Afrikaans, Northern Sotho, Tswana: Gauteng; Xhosa: iRhawuti; Tsonga: Gauteng; Southern Ndebele: I-Gauteng; Venda: Gauteng), which means "place of gold", is one of the nine provinces of South Africa. 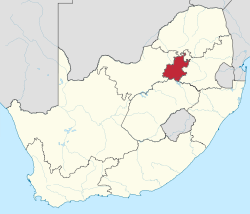 Situated in the Highveld, Gauteng is the smallest province in South Africa, accounting for only 1.5% of the land area. Nevertheless, it is highly urbanised, containing the country's largest city, Johannesburg, its administrative capital, Pretoria, and other large areas such as Midrand and Vanderbijlpark. As of 2018[update], Gauteng is the most populous province in South Africa with a population of approximately 14,700,000 people according to estimates. The name Gauteng is derived from the Sotho name, gauta meaning "gold" with the locative suffix -eng. There was a thriving gold industry in the province following the 1886 discovery of gold in Johannesburg. In Sesotho, the name Gauteng was used for Johannesburg and surrounding areas long before it was adopted in 1994 as the official name of a province. Gauteng was formed from part of the old Transvaal Province after South Africa's first multiracial elections on 27 April 1994. 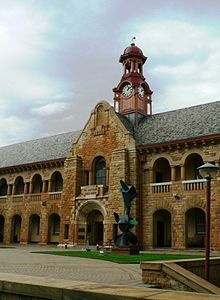 It was initially named Pretoria–Witwatersrand–Vereeniging (PWV) and was renamed "Gauteng" in December 1994.. The term "PWV", describing the region existed long before the establishment of the province. The history of the area that is now Gauteng can be traced back to the early 1800s when settlers originating from the Cape Colony defeated chief Mzilikazi and started establishing villages in the area. The city of Pretoria was founded in 1855 as capital of the South African Republic (ZAR). After the discovery of gold in 1886, the region proceeded to become the single largest gold producer in the world and the city of Johannesburg was founded. The older city Pretoria was not subject to the same attention and development. Pretoria grew at a slower rate and was highly regarded due to its role in the Second Boer War. The Cullinan Diamond which is the largest diamond ever mined was mined near Pretoria in a nearby town called Cullinan in the year 1905. Gauteng has only been properly documented since the 1800s and as a result, not much information regarding its history predating the 1800s is available. At the Sterkfontein caves, some of the oldest fossils of hominids have been discovered, such as Mrs. Ples and Little Foot. Many crucial events happened in present-day Gauteng with regards to the anti-apartheid struggle, such as the Sharpeville massacre of 1960, the Rivonia Trial in 1963 and 1964 and the Soweto Uprising of 1976. Today, the Apartheid Museum stands testament to these struggles in Johannesburg. Gauteng is governed by the Gauteng Provincial Legislature, a 73-person unicameral legislature elected by party-list proportional representation. The legislature elects one of its members as Premier of Gauteng to lead the executive, and the Premier appoints an Executive Council of up to 10 members of the legislature to serve as heads of the various government departments. The provincial government is responsible for the topics allocated to it in the national constitution, including such fields as basic education, health, housing, social services, agriculture and environmental protection. The most recent election of the provincial legislature was held on 7 May 2014, and the African National Congress (ANC) won 53.59% of the vote and a 40-seat majority in the legislature. The official opposition is the Democratic Alliance, which won 30.78% of the vote and 23 seats. Other parties represented are the Economic Freedom Fighters with eight seats and the Freedom Front Plus and the Inkatha Freedom Party with one seat each. Premier David Makhura of the ANC was elected on 21 May 2014, at the first meeting of the legislature after the general election. The Gauteng Division of the High Court of South Africa, which has seats in Pretoria and Johannesburg, is a superior court with general jurisdiction over the province. Johannesburg is also home to the Constitutional Court, South Africa's highest court, and to a branch of the Labour Court and Labour Appeal Court. The undulating hills that form part of the rural areas in the province just north of Johannesburg. Although Gauteng is a heavily urbanised province much of its area extensively cultivated for agriculture. Gauteng's southern border is the Vaal River, which separates it from the Free State. It also borders on North West to the west, Limpopo to the north, and Mpumalanga to the east. Gauteng is the only landlocked province of South Africa without a foreign border. Most of Gauteng is on the Highveld, a high-altitude grassland (circa 1,500 m or 4,921 ft above sea level). Between Johannesburg and Pretoria there are low parallel ridges and undulating hills, some part of the Magaliesberg Mountains and the Witwatersrand. The north of the province is more subtropical, due to its lower altitude and is mostly dry savanna habitat. In the southern half of Gauteng the Witwatersrand area is an old term describing a 120km wide oblong-shaped conurbation from Randfontein in the West to Nigel, Gauteng in the East. This area is also often referred to simply as "Witwatersrand", "the Rand" or "the Reef" (archaic). 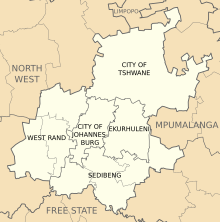 It has traditionally been divided into the three areas of East Rand (now Ekurhuleni), Central Rand (approximately today's Johannesburg Municipality) and West Rand. The climate is mostly influenced by altitude. Even though the province is at a subtropical latitude, the climate is comparatively cooler, especially in Johannesburg, at 1,700 m (5,577 ft) above sea level (Pretoria is at 1,330 m or 4,364 ft). Most precipitation occurs as brief afternoon thunderstorms; however, relative humidity never becomes uncomfortable. Winters are crisp and dry with frost occurring often in the southern areas. Snow is rare, but it has occurred on some occasions in the Johannesburg metropolitan area. The former Metsweding district consisting of Nokeng Tsa Taemane and Kungwini in the North of the province was incorporated into Tshwane in 2011. Gauteng Province is home to 13.2 million people (2015 South African National Census), almost 25% of the total South African population. Gauteng Province is also the fastest growing province, experiencing a population growth of over 33% between the 1996 and 2011 censuses, thus Gauteng now has the largest population of any province in South Africa, though the smallest area. As of the census of 2011, there are 12,272,263 people and 3,909,022 households residing in Gauteng. The population density is 680/km². The density of households is 155.86/km². About 22.1% of all households are made up of individuals. The average household size is 3.33. The province's age distribution was 23.6% under the age of 15, 19.6% from 15 to 24, 37.9% from 25 to 44, 15.0% from 45 to 64, and 4.0% who are 65 years of age or older. The median age is 27 years. For every 100 females there are 101.2 males. For every 100 females age 18 and over, there are 102.3 males. In the province, 14.4% of residents speak Afrikaans at home, 12.5% speak English, 1.5% speak IsiNdebele, 7.3% speak IsiXhosa, 20.5% speak IsiZulu, 10.7% speak Sepedi, 13.1% speak Sesotho, 8.4% speak Setswana, 1.2% speak SiSwati, 4.2% speak Tshivenda, and 5.1% speak Xitsonga. 1.0% of the population speaks a non-official language at home. 76.0% of residents are Christian, 18.4% have no religion, 1.7% are Muslim, 0.5% are Jewish, and 0.8% are Hindu. 2.6% have other or undetermined beliefs. 8.4% of residents aged 20 and over have received no schooling, 11.2% have had some primary, 5.5% have completed only primary school, 34.3% have had some high education, 28.0% have finished only high school, and 12.6% have an education higher than the high school level. Overall, 40.6% of residents have completed high school. 56.1% of housing units have a telephone and/or mobile phone in the dwelling, 41.5% have access to a phone nearby, and 2.3% have access that is not nearby or no access. 82.8% of households have a flush or chemical toilet. 84.2% have refuse removed by the municipality at least once a week and 2.6% have no rubbish disposal. 47.2% have running water inside their dwelling, 83.6% have running water on their property, and 97.5% have access to running water. 73.2% of households use electricity for cooking, 70.4% for heating, and 80.8% for lighting. 77.4% of households have a radio, 65.7% have a television, 15.1% own a computer, 62.1% have a refrigerator, and 45.1% have a mobile phone. 25.8% of the population aged 15–65 is unemployed. The median annual income of working adults aged 15–65 is R 23 539 ($3,483). Males have a median annual income of R 24 977 ($3,696) versus R 20 838 ($3,083) for females. Gauteng is the province with the second highest life expectancy in the country with females having a life expectancy of 63 years and males having a life expectancy of 61 years. At birth, life expectancy for 2013 is approximated at 57 years and 61 years for males and females respectively. This marks an improvement of a whole year in the life expectancy of South Africans as a whole. Previously described as the PWV complex, the urban conurbation of Gauteng, referred to as the Gauteng City Region, contains the major urban populations of Johannesburg (7,860,781 as of 2011[update]), Pretoria (1,763,336), Vereeniging (377,922), Evaton (605,504) and Soshanguve (728,063), coming to an urban population of over 11 million. Thomas Brinkhoff lists a "Consolidated Urban Area" in Gauteng as having a population of 13.1 million as of January 2017[update]. The future governmental plans for the region indicate the gradual urbanisation and consolidation towards the creation of a megalopolis that connects these metros. The GCRO is a collaboration between the Universities of Johannesburg and Witwatersrand, the city of Johannesburg, Gauteng Provincial Government, and SALGA-Gauteng. The GCRO's purpose is to collect information and create a database on the Gauteng City Region to provide to Government, Law makers and civil society an informed understanding of the fastest urbanizing region in Southern Africa. Gauteng is considered the economic hub of South Africa and contributes heavily in the financial, manufacturing, transport, technology, and telecommunications sectors, among others. It also plays host to a large number of overseas companies requiring a commercial base in and gateway to Africa. Gauteng is home to the Johannesburg Stock Exchange, the largest stock exchange in Africa. Some of the largest companies in Africa and abroad are based in Gauteng, or have offices and branches there, such as Vodacom, MTN, Neotel, Microsoft South Africa and the largest Porsche Centre in the world. Although Gauteng is the smallest of South Africa's nine provinces—it covers a mere 1.5% of the country's total land area, the province is responsible for a third of South Africa's gross domestic product (GDP). Gauteng generates about 10% of the total GDP of sub-Saharan Africa and about 7% of total African GDP. SANRAL, a parastatal, is responsible for the maintenance, development and management of all national road networks in South Africa. SANRAL is responsible for instituting the Gauteng Freeway Improvement Project, which was met with a lot of opposition due to the tolling of Gauteng motorists. Many important national routes run through Gauteng such as the N1, N3, N4, N12, N14 and the N17. Johannesburg is quite dependent on freeways for transport in and around the city. The R21, R24, R59, M1 and M2 all run through Johannesburg. The Gauteng Freeway Improvement Project led to a large decrease in traffic congestion when construction finished 2011–2012. Cape Town, for the first time in decades, is now the most congested city in South Africa. PUTCO, the largest commuter bus operator in South Africa, services the Gauteng area extensively. The bus rapid transit system Rea Vaya also serves to transport people from Johannesburg's southern neighbourhoods into and around the CBD. In an interview, Parks Tau stated that by the year 2040, Johannesburg will be dominated by pedestrians and public transport as opposed to the use of private transport or informal transport, such as minibus taxis. Gautrain and Metrorail both service the province's public transport sector where trains are concerned and Gautrain offers a bus service that transports commuters to and from various train stations and predetermined bus stops. Metrorail trains are considered one of the most cost-effective methods of transportation in and around Gauteng. The OR Tambo International Airport, Rand Airport, Lanseria International Airport, Wonderboom Airport and Grand Central Airport are located in Gauteng. There is a large informal transport sector in Gauteng, consisting of thousands of minibus taxis, which many of the urban and rural population makes use of. However, it is noted that taxis are often unsafe as their drivers ignore the rules of the road and the vehicles are often not roadworthy. The City of Johannesburg stated that: "major initiatives are under way to completely reform the taxi industry and provide more comfort and safety to customers." Gauteng is a large center of learning in South Africa, and it has many universities and other educational institutions of higher learning. In 2002, the Gauteng Department of Education founded an initiative called Gauteng Online in an attempt to get the entire province to utilize a wide assortment of electronic and telecommunications systems. In 2007, this initiative was handed over to the Gauteng Department of Finance. In the 2013 national budget speech, it was announced that the Gauteng Department of Education would be granted over R700 million to improve education and to alleviate issues concerning the overcrowding in schools, a shortage in teaching staff and transport for poor pupils. Although Gauteng province is dominated by the urban areas of Johannesburg and Pretoria, it has several nature reserves. Gauteng is home to the Cradle of Humankind UNESCO World Heritage Site which includes the Sterkfontein caves and the Wonder Cave Kromdraai. Johannesburg is home to the largest man-made urban forest in the world. Gauteng is home to many stadia and sporting grounds, notably: Soccer City, Ellis Park Stadium, Odi Stadium, Loftus Versfeld Stadium, Orlando Stadium, Johannesburg Stadium, the Wanderers Stadium and SuperSport Park. Several teams from Gauteng play in the country's top-level association football (more commonly referred to as soccer) league, the Premier Soccer League (PSL), including Kaizer Chiefs and Orlando Pirates. The national squad Bafana Bafana's home stadium is Soccer City in Johannesburg. During the 2010 FIFA World Cup, the first ever world cup held by an African nation, Gauteng's stadia hosted many games. The first ever FIFA world cup match on African soil took place at Soccer City on 11 June 2010. Along with Soccer City, Loftus Versfeld Stadium and Ellis Park Stadium hosted matches in Gauteng. Rugby, or more accurately rugby union, is a popular sport in South Africa, and in Gauteng in particular. Two rugby teams from Gauteng participate in the Southern Hemisphere Super Rugby championship: the Pretoria-based Bulls, and the Johannesburg-based Lions (previously the Cats). Three Gauteng-based teams play in the country's domestic competition, the Currie Cup: the Blue Bulls from Pretoria, the Golden Lions from Johannesburg and the Falcons from the East Rand. In 1995, South Africa hosted the 1995 Rugby World Cup and proceeded to win the tournament at Ellis Park Stadium on 24 June 1995. The events surrounding the world cup formed the basis of the story for the movie Invictus. Many South African universities take part in the Varsity Rugby league. Of these, the Gauteng universities include the University of Pretoria, the University of Johannesburg and the University of the Witwatersrand. Cricket is also widely popular among all cultural groups in the country, and is the only sport to feature in the top two among all of South Africa's major ethnic/racial groups. The Highveld Lions represent both Gauteng and North West in the country's three domestic competitions—the first-class SuperSport Series, the List A one-day MTN Domestic Championship and the Twenty20 Standard Bank Pro 20 Series. Many marathons take place in Gauteng, such as the Gauteng Marathon, the Arwyp Medical Centre 15 km Nite Race and the Trisport Joburg City Triathlon. Gauteng's favourable weather conditions throughout the year make it an ideal hub for sports and other out door activities. This makes golf, horse racing and swimming very popular. The Vaal River facilitates water sports in the forms of jet skiing, water skiing and motor boating. Adventure sports are also quite popular in Gauteng, particularly skydiving, paragliding and hang-gliding. The amusement park Gold Reef City is situated in Gauteng, as is the Johannesburg Zoo and the Pretoria Zoo. Botanical gardens in the province include the Pretoria and Walter Sisulu national botanical gardens maintained by the South African National Botanical Institute as well as the Johannesburg and Manie van der Schijff botanical gardens. The Ticketpro Dome and the Gallagher Convention Centre, which are both popular events and expos venues, are also located within Gauteng. ^ a b c d Census 2011: Census in brief (PDF). Pretoria: Statistics South Africa. 2012. ISBN 9780621413885. Archived (PDF) from the original on 13 May 2015. ^ Mid-year population estimates, 2017 (PDF) (Report). Statistics South Africa. 31 July 2018. p. 3. Retrieved 29 July 2018. ^ a b Stats in brief, 2006 (PDF). Pretoria: Statistics South Africa. 2006. p. 3. ISBN 0-621-36558-0. Retrieved 14 January 2011. ^ "Mid-year population estimates" (PDF). Statistics South Africa. 2018. Retrieved 2018-11-13. ^ a b c d e f g h "General Overview of Gauteng" (PDF). Makiti Guides and Tours (Pty) Ltd. Retrieved 2 May 2013. ^ "About Gauteng". Gauteng Provincial Government. Archived from the original on 4 August 2008. Retrieved 25 October 2008. ^ a b c d e "Gauteng". South African History Online. Retrieved 3 May 2013. ^ a b c d e f g "From mining village to commercial powerhouse – History of Gauteng". southafrica.net. Retrieved 3 May 2013. ^ South African Journal of Science. South African Association for the Advancement of Science. 1975. p. 365. ^ "Maps - Johannesburg (South Africa) – Gold mining belt Witwatersrand". Diercke International Atlas. BMS-Verlage GmbH. ^ Location Settings (7 August 2012). "Johannesburg marvels at rare snowfall". News24. Retrieved 19 May 2013. ^ 7 August 2012 at 10:53pm (7 August 2012). "Snow forces road closures across SA – South Africa | IOL News". IOL.co.za. Retrieved 19 May 2013. ^ "Pretoria Climate Normals 1961−1990". National Oceanic and Atmospheric Administration. Retrieved 8 October 2016. ^ "Klimatafel von Pretoria (Wetteramt), Transvaal / Südafrika" (PDF). Baseline climate means (1961-1990) from stations all over the world (in German). Deutscher Wetterdienst. Retrieved 8 October 2016. ^ "Climate data for Pretoria". South African Weather Service. June 2011. Archived from the original on 8 March 2010. Retrieved 6 March 2010. ^ "World Weather Information Service – Johannesburg". World Meteorological Organization. Retrieved 8 April 2013. ^ "Johannesburg/Jan Smuts Climate Normals 1961–1990". National Oceanic and Atmospheric Administration. Retrieved 8 April 2013. ^ "Climate data for Johannesburg". South African Weather Service. Archived from the original on 8 March 2010. Retrieved 6 March 2010. ^ "South Africa - Languages". Encyclopedia Britannica. Retrieved 27 November 2017. ^ "South Africa: Provinces and Major Urban Areas". www.citypopulation.de. Retrieved 27 November 2017. ^ "Major Agglomerations of the World - Population Statistics and Maps". www.citypopulation.de. 1 January 2017. Retrieved 8 December 2017. ^ "Johannesburg Securities Exchange". The City of Johannesburg. Retrieved 14 April 2013. ^ "Vodacom History". African Wireless. Retrieved 14 April 2013. ^ "MTN Home". MTN Group. Retrieved 14 April 2013. ^ "Neotel Contact Us". Neotel. Retrieved 14 April 2013. ^ "Microsoft ZA Home". Microsoft. Retrieved 14 April 2013. ^ "Porsche South Africa". Porsche. Retrieved 14 April 2013. ^ "Gauteng Economic Development Agency". Archived from the original on 5 April 2008. Retrieved 11 April 2008. ^ "SANRAL". National Roads Agency. Retrieved 2 May 2013. ^ "COSATU, DA, SANCO agree joint petition on Gauteng tolls". Politicsweb.co.za. Retrieved 2 May 2013. ^ "Government Gazette" (PDF). South African Government Printing Works. 25 October 2012. Archived from the original (PDF) on 13 March 2013. Retrieved 2 May 2013. ^ "TomTom Traffic Index". Retrieved 29 November 2015. ^ "R750 million to fight traffic in SA's most congested city". Retrieved 29 November 2015. ^ "Learnership Opportunity with PUTCO". idrive.co.za. Retrieved 2 May 2013. ^ "About Us: Mr. Franco Pisapia, the MD of PUTCO Ltd". PUTCO. Archived from the original on 10 February 2012. Retrieved 2 May 2013. ^ "Home". Rea Vaya. Retrieved 23 October 2011. ^ "IDP PLANS FOR THE FUTURE". Rea Vaya. Retrieved 2 May 2013. ^ "Objectives, Gautrain – The Gautrain Project". Gautrain. Retrieved 2 May 2013. ^ "Welcome to Metrorail". Metrorail. Retrieved 2 May 2013. ^ "Gautrain – Buses". Gautrain. Retrieved 2 May 2013. ^ a b "City of Johannesburg – Trains". Joburg.org.za. Archived from the original on 31 July 2013. Retrieved 19 May 2013. ^ "Airports Company South Africa – O.R. Tambo International Airport". Airports Company South Africa. Archived from the original on 23 May 2013. Retrieved 2 May 2013. ^ "Rand Airport – Your Aviation Hub". Rand Airport. Retrieved 2 May 2013. ^ "Lanseria International Airport – Home". Lanseria International Airport. Retrieved 2 May 2013. ^ a b c "City of Johannesburg – Taxis". Joburg.org.za. Archived from the original on 30 April 2015. Retrieved 19 May 2013. ^ a b By Mariné Jacobs Johannesburg, 17 May 2013. "Govt denies Gauteng Online is ineffective". ITWeb. Retrieved 19 May 2013. ^ "Education get lion's share of Gauteng's funds". iol.co.za. 5 March 2013. Retrieved 2 May 2013. ^ "Green tourism – Gauteng Tourism Authority". Gauteng.net. Retrieved 19 May 2013. ^ "City of Johannesburg – Joburg's urban forest to grow". Joburg.org.za. 30 August 2007. Archived from the original on 30 April 2015. Retrieved 19 May 2013. ^ Hamilton Wende, CNN. "Johannesburg expands its urban forest". CNN.com. Retrieved 19 May 2013. ^ "Host nation of 2010 FIFA World Cup − South Africa". FIFA. 15 May 2004. Archived from the original on 12 November 2009. Retrieved 3 May 2013. ^ "Host nation of 2010 FIFA World Cup – South Africa". FIFA. Archived from the original on 12 November 2009. Retrieved 3 May 2013. ^ "Soccer City Stadium – Johannesburg". FIFA. Retrieved 3 May 2013. ^ "A guide to all the stadiums to be used at the 2010 FIFA World Cup in South Africa – FIFA.com". FIFA. Retrieved 3 May 2013. ^ "IRB Rugby World Cup – Johannesburg, 24 June 1995, 15:00 local, 13:00 GMT". ESPN. Retrieved 3 May 2013. ^ Stephenson, Hunter (14 March 2009). "First Look: Clint Eastwood's The Human Factor with Matt Damon". slashfilm.com. Retrieved 3 May 2013. ^ "The Gauteng Marathon | Runner's World Magazine". Runnersworld.co.za. 2 September 2012. Archived from the original on 17 August 2012. Retrieved 19 May 2013. ^ "Arwyp Medical Centre 15km Nite Race | Runner's World Magazine". Runnersworld.co.za. 26 January 2011. Archived from the original on 11 March 2013. Retrieved 19 May 2013. ^ "Trisport Joburg City Triathlon (incorporating CGT Champs) | Runner's World Magazine". Runnersworld.co.za. 6 February 2011. Archived from the original on 7 February 2011. Retrieved 19 May 2013. ^ a b c "Sports and outdoor events – Gauteng Tourism Authority". Gauteng.net. Retrieved 19 May 2013. ^ "Gold Reef City > About Us". Gold Reef City. Retrieved 2 May 2013. ^ "About The Zoo". Johannesburg Zoo. Retrieved 2 May 2013. ^ "NZG – About Us". National Zoological Gardens of South Africa. Archived from the original on 13 April 2013. Retrieved 2 May 2013. ^ "Gardens". South African National Botanical Gardens. ^ "The Johannesburg Botanical Garden". Johannesburg City Parks. ^ "The Ticketpro Dome". The Ticketpro Dome. Retrieved 2 May 2013. ^ "About – Gallagher Convention Centre". Gallagher Convention Centre. Archived from the original on 10 April 2013. Retrieved 2 May 2013. 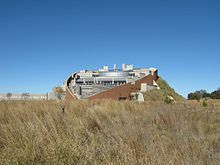 Wikimedia Commons has media related to Gauteng.